On 1 April 2019 the Children and Family Health Devon service became operational. The service was previously provided by Virgin Care Ltd. The Children and Family Health Devon service is run by a group of organisations working together, including Devon Partnership Trust, the Royal Devon and Exeter NHS Foundation Trust, Northern Devon Healthcare NHS Trust, Livewell South West, University Hospitals Plymouth NHS Trust, and Torbay and South Devon NHS Foundation Trust (the lead partner). Staff at Devon Partnership Trust are responsible for providing the emotional health and wellbeing services (CAMHS) in all localities, whilst the local acute NHS Trusts will be responsible for delivering the remaining services on a locality basis (for example, the services in South Devon will be the responsibility of Torbay and South Devon NHS Foundation Trust). Our vision is to be a successful, vibrant, partnership that benefits the communities we serve. 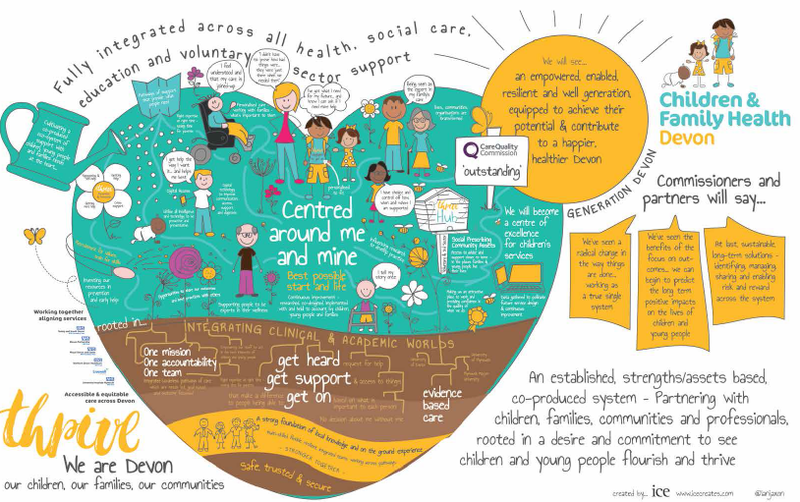 The animation below tells the story of how we moved to viewing the future services through the children, young people and families’ eyes and experiences. Watch the animation by clicking on the image below or clicking here.